Sadie's Gathering: Where's the Sequel? With all the news and headlines lately, my posts have been a little more serious than I typically veer to. We'll get back there no doubt; but for today, thought I'd go a tad lighter. Remember the lovely, pictured above? It was published in 2011. Think the pdf went viral before it was even published; because I remember laughing over it in California in 2010, after a friend emailed it to me. Then I remember rushing out to Barnes & Noble to get a copy, out of fear, before it was banned or abridged. The interesting thing is, I still pull it out from time to time to get a little comic relief from what is still a battle nearly every single night. -or a tea party among dolls, where each doll needs a new hairdo which can only be completed with bands from the Rainbow Loom, which is downstairs, in the back room. 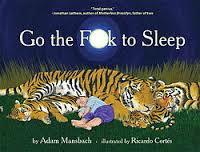 So, to Mr. Mansbach, I humbly request, another lovely about going to bed, for parents of the older set. You Have To F**king Eat! And just as Samuel Jackson, did a brilliant reading of GTFTS;Byran Cranston, and Stephen Fry, lend their talents to YHTFE. Click on each of their names to be whisked there. Please consider another addition to your parental comic relief line: "Please Get The F... Dressed!" Based on my experience over the past weeks; I may write a quickie down myself.